There are probably some high fives on the trading floor. Stocks snapped a two-day losing streak Wednesday as worries about the Fed's interest rate policy abated. The Dow Jones industrial average, the S&P 500 and the Nasdaq all gained ground, bouncing back from losses over the past two days. The Dow and S&P 500 ended up about 0.5%. 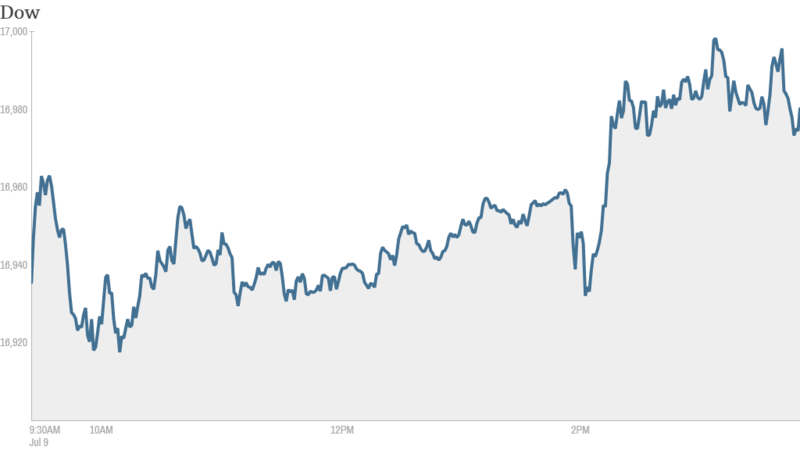 The Nasdaq gained 0.6%. 1. Fed minutes: Stocks got a boost after the Federal Reserve released minutes from its latest policy meeting, which seemed to assuage fears about any precipitous interest rate increases. "Overall, no major surprises," said Jim O'Sullivan, chief U.S. economist at High Frequency Economics. The Fed could end its bond buying program as soon as October, assuming the economy continues to perform as officials expect, according to minutes from the central bank's June policy meeting. The central bank has been shrinking its monthly bond purchases since January and is widely expected to complete the program this year. But it had not mentioned a specific month until now. Most Fed officials predict interest rates to remain low for the next few years. According to the minutes, 12 meeting participants said hiking interest rates would not be warranted until "sometime in 2015," while three said "policy firming" wouldn't be appropriate until 2016. Only one participant argued for a rate hike in 2014. Stocks tumbled Tuesday on concerns that interest rates could be going up sooner rather than later. 2. Stock market movers -- Alcoa up, The Container Store down: Shares in Alcoa (AA) rose after kicking off earnings season by beating analyst estimates. Overall, earnings for the companies in the S&P 500 are expected to be up 4.9% in the second quarter, compared with the same period last year, according to FactSet. Shares in Gigamon (GIMO) were down again Wednesday after plunging a whopping 33% on Tuesday. The technology company had lowered its revenue guidance for the second quarter. 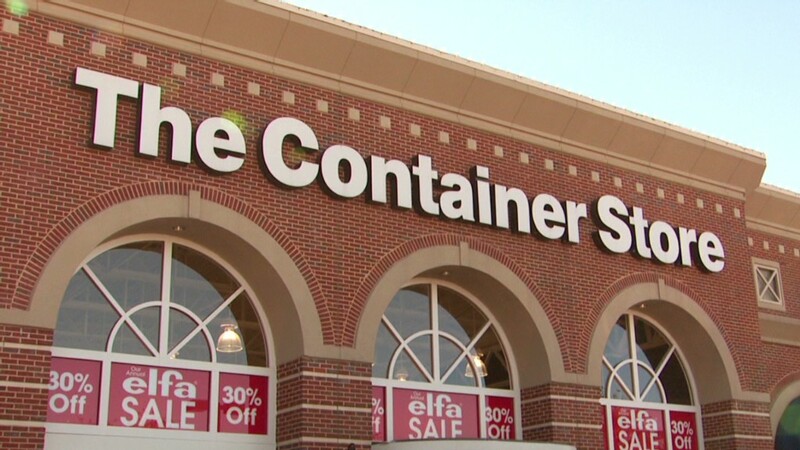 The Container Store (TCS) was also suffering -- down over 8% -- after reporting sluggish same-store sales. 3. Next big banking fine: Citigroup (C) is reported to be close to agreeing to pay $7 billion to settle a U.S. government investigation into the sale of mortgage backed securities. The deal would include billions in help for borrowers, according to the reports. The stock moved little. JP Morgan (JPM) paid $13 billion last year to settle similar charges. European banks have been in regulators' cross hairs more recently. Earlier this month, French bank BNP pleaded guilty to criminal charges for breaching U.S. sanctions and will pay a record penalty of almost $9 billion. The bank violated U.S. money laundering laws by helping clients dodge sanctions on Iran, Sudan and other countries. U.S. officials are also said to be investigating Germany's Commerzbank for sanctions violations. 4. International markets overview: The stock market in Brazil was closed for a holiday Wednesday, one day after the Brazilian national soccer team suffered a humiliating defeat to the Germans in the World Cup. But investors seemed to view the loss as a boon for Brazilian stocks. The iShares MSCI Brazil Capped ETF (EWZ), which tracks shares of several leading Brazilian companies, gained more than 1%. And if stocks are anything to go by, Argentina's market is up 2% so far this week while the Netherlands' is down 2%. The two countries face off in World Cup action today. European markets ended mixed. Asian markets lost ground as subdued China inflation data provided more evidence that the economy is struggling to pick up pace after a below-target performance in the first quarter.